When the crowds of tourists decline in Sydney in the upcoming autumn of the southern hemisphere, some productions of the Opera Australia from the famous Sydney Opera House move to Melbourne for the happiness of the regional audience. The over 2,000-seat State Theatre is located in the modern Arts Centre with its distinctive 162 m high tower, which was clearly inspired by the Eiffel Tower in Paris. 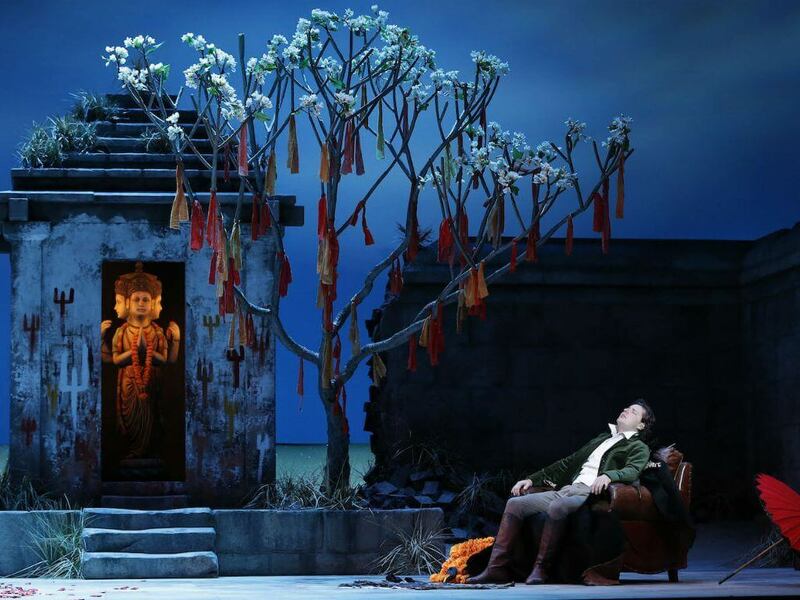 In May two operas were given, “La Bohème” and the new production of “The Pearlfishers” by Georges Bizet which premiered in Sydney in January 2016. 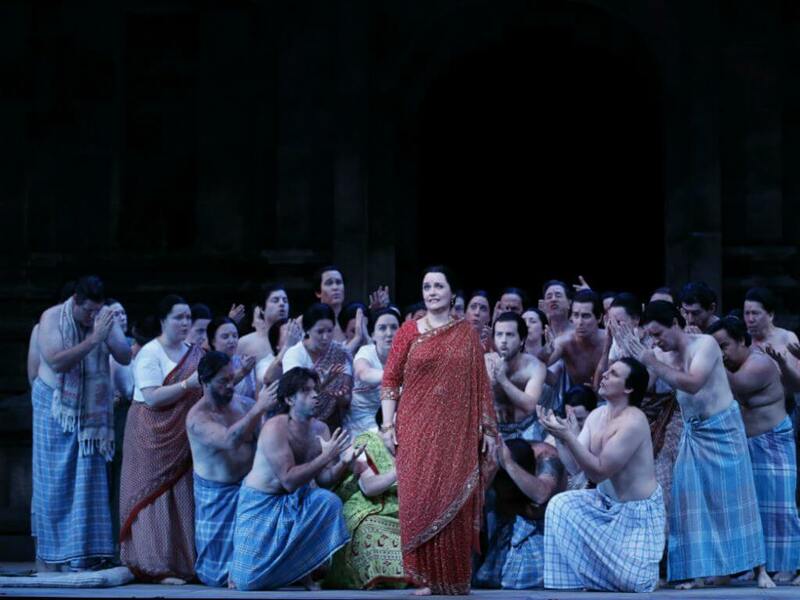 This rather rarely given opera has a thematic significance in Australia as many people still earn their income as pearl fishers, particularly in Western Australia. The Australian director Michael Gow managed the balancing act of a successful revision of the substance without cuts in music and libretto according to the remains of the original artwork. Of the subsequent amendments, he took only the famous duet “Au font du temple saint” from the revival of 1893. Inspired by Leonard Woolf’s Ceylon descriptions, Gow changed direction to the origin of the three male figures. 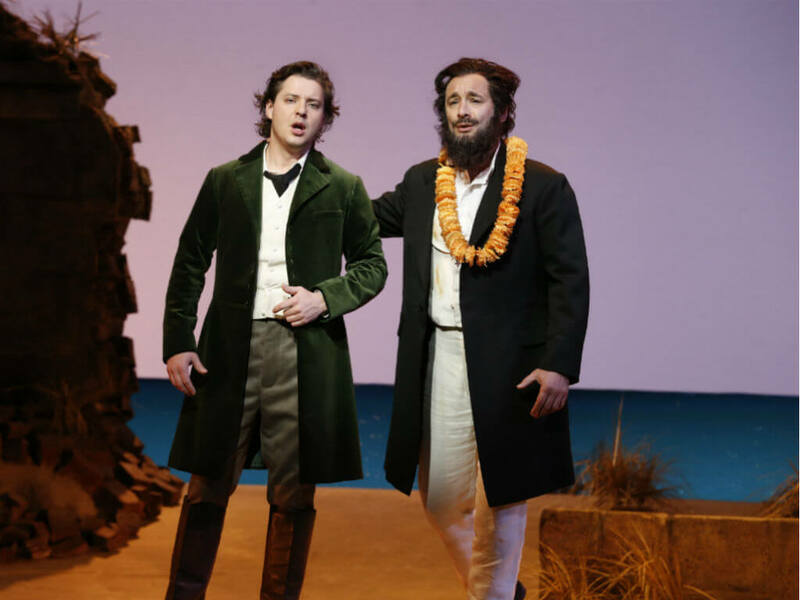 In his version they live in Ceylon as expatriates in the 1860s, the time when the opera has been created. Zurga works as an easily deluded pearl dealer away from home, Nadir is as romantic in search of himself currently acting as a hunter. This explains their former friendship while Nadir understands nothing of pearl fishing which in the libretto is still a contradiction. The high priest Nourabad here becomes a human trader. Leila remains unchanged an oriental temple priestess with a mysterious aura which the two rivals were attracted only because of her singing and putting their friendship at risk. Since Bizet designed his work already as a departure from the opulent grand opera style, designer Robert Kemp used on a realistic scenery to support both action and people development with effective lighting by Matt Scott. 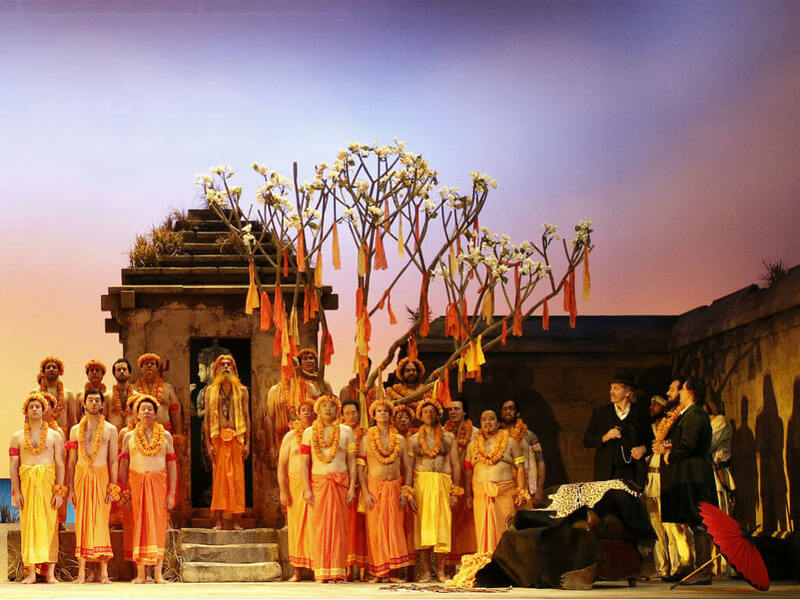 In the first act, the ensemble plays in colourful clothes on the harbour overlooking the lake between stone walls and Hindu temples, only a leather chair disturbs the sight in which Zurga receives his coronation procedure. The second act is dominated by palace walls with a guarded gate to illustrate Leila’s night rest where she met Nadir before an impetuous storm begins with their discovery which brings the ensemble on stage in their pajamas. The interior of Zurgas palace in the first image of the third act is a reminiscent of colonial buildings, while the final scene returns to the gate between the palace walls. Gow leaves the ending after escaping from Leila and Nadir open as Nourabad’s helpers come with a knife from behind towards Zurga’s back before the curtain falls. The costumes complement a harmonious stage which does not want to detract from the synopsis and has fortunately not transposed to the present times. Compared to the first season in Sydney, the shows in Melbourne saw other performers. As Leila acted the Western Australian grown Emma Matthews who played diverse roles at Opera Australia since 1993 and convinced by her delicate coloratura soprano, her mysterious game and the associated attraction. The Russian singer Dmitry Korchak played the same role before in the “Theater an der Wien” in Vienna by end of 2014, he gave a young Nadir in an enthusiastic performance, especially in the lyrical passages with a remarkably converted flow of shallow melodies, in particular in the famous aria “Je crois entender encore”. Optically remembering the typical bearded Tevye in “Fiddler on the Roof”, the Argentinian singer José Carbó played the role of Zurga with strong temperament using his rounded baritone. He continued the transformation of his character well and performed the famous duet with Nadir. Finally, Steven Gallup gave a slightly greasy Nourabad with his voluminous bass. The Orchestra Victoria played the exotic-tinged melodies under the active conducting of musical director Guillaume Tourniaire while Anthony Hunt arranged the wonderful choral scenes. Since the two operas are given almost daily in Melbourne, it is wise to choose a few days in Melbourne according to the theatre schedule. The State Theatre will set again glamorous exclamation in November and December repeating entire “Ring Cycle” of Richard Wagner in the staging of director Neil Armfield each during a week three times again after its premiere in 2013.